The temple fair, usually on the open ground in or near a temple, is held on festive or specified days. 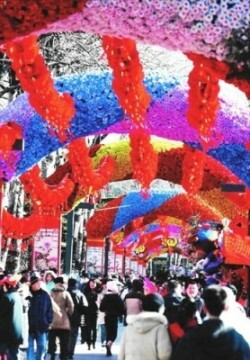 Some are held only during the Spring Festival (chūn jié 春节). Although different places hold their temple fair at various dates, the contents are similar. Farmers and merchants sell their farm produce, local specialties, and antiques (gǔ wán 古玩), jade articles, flowers, birds and fish; craftsmen set up their stalls to show and sell their handicrafts (shǒu gōng yì pǐn 手工艺品) and specialty snacks (tè sè xiǎo chī 特色小吃); folk artists establish a stage for singing, dance, and quyi (Chinese folk art forms qǔ yì 曲艺, including ballad singing (mín gē 民歌), story-telling (píng shū 评书), comic dialogues (xiǎo pǐn 小品), clapper talk (kuài bǎn 快板), cross talk (xiàng sheng 相声), etc.) performance. Ordinary people come to the temple fair to buy and sell goods, watch the performances, and sample snacks, giving the temple fair a bustling atmosphere. Beijing's temple fair originated during the Liao Dynasty (liào dài 辽代 916-1125) and continued through several dynasties including the Yuan (yuán dài 元代 1271-1368), the Ming (míng dài 明代 1368-1644) and the Qing (qīng dài 清代 1644-1911). Because it begins around the temple, it is called the 'temple' fair. There were always some small traders and peddlers who set up various stalls outside the temple to earn money from people who came to the temple to burn joss sticks and worship Buddha. Gradually the temple fair became a regular activity and is now a local folk custom in Beijing. The temple fairs in Beijing may roughly be divided into three kinds: One is the monthly temple fair, during the later period of the monthly temple fairs the rural fair develops with many businesses and entertainment. There is also a temporary temple fair opened according to convention whenever there are traditional festivals or something related to sacrificial offering activities for Buddhism (fó jiào 佛教) or Taoism (dào jiào 道教). The characteristic of this kind of temple fair is that they are often held primarily for religious activities; however, some commodities and toys will be available for purchase, and folk entertainers put on performances. The third kind of temple fair is for multi-professions. In the past, many professions had a common practice of sacrificing offerings to their founders, once a year. Generally they hold the fair on the birthday of the founder of their own profession. 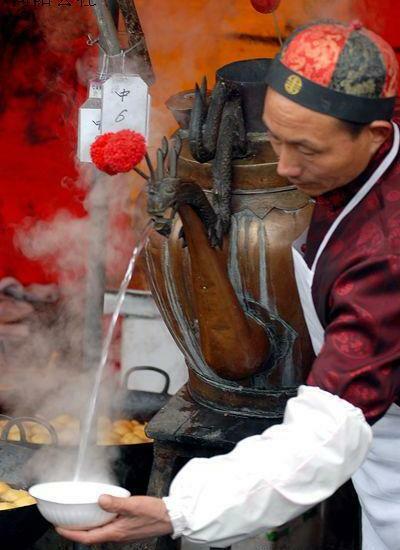 Now, Beijing holds temple fair every Spring Festival. Relatively famous temple fairs are those of the White Cloud Temple (bái yún guān 白云观), the Altar of Earth (dì tán 地坛), Dragon Pool (lóng tán hú 龙潭湖) and the Temple of Intense Happiness (lóng fú sì 隆福寺). Temple fairs in Beijing have preserved many traditional customs, such as riding a monkey to stroll around the temple fair and throwing coins through the hole in the center of a copper coin in the White Cloud Temple. Many goods sold in the temple fair have typical northern features, such as toys like diabolo (kōng zhú 空竹), pinwheel (fēng chē 风车), knife (dāo 刀), spear (qiāng 枪), sword (jiàn 剑) and halberd (jǐ 戟); big sugarcoated haws on a stick and gruel of millet flour and sugar are widely popular among common people. 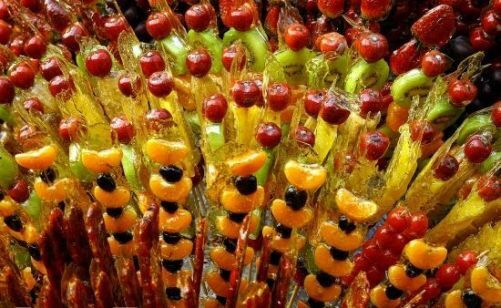 Various artistic folk performances, rich tasty snacks of Beijing and the folk handicrafts are the most attractive points of this fair. The yangge (yāng gē 秧歌), stilts (cǎi gāo qiāo 踩高跷), land boat (huá hàn chuan 划旱船), lion dance (wǔ shī 舞狮) all pass by in front of your eyes; playing the steel fork, tiger stick showing, gong and drum beating… performing again and again for your enjoyment. You may also buy clay, bristled figurines (shuā máo yǒng 刷毛俑), dough figurines (miàn rén 面人) and paper-cuts (jiǎn zhǐ 剪纸), which are characteristic of local culture and Beijing charm. If you are lucky you may also find genuine Chinese antiques of fine quality at reasonable prices.